A brief History of the business and the Simon family. By the late 1960's sand and gravel production began to increase and machinery was acquired to help the family mechanise the operation. 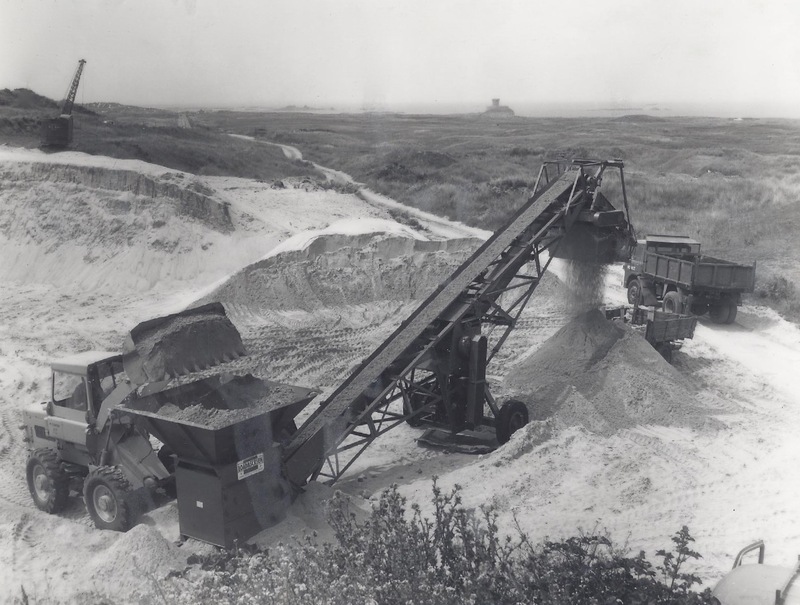 Osmund persuaded the quarry owner, his father Walter J Simon, to invest in the future and the first machine used in the quarry was a Rustin Bucyrus 10RB drag-line. It was used to remove the vegetation and overburden. This was soon followed by an International Hough H30 pay loader and a sand processing screener from Loadascreen. All this plant can be seen working in this picture which also includes one of Ronez's Ford D Series lorry waiting to be loaded. 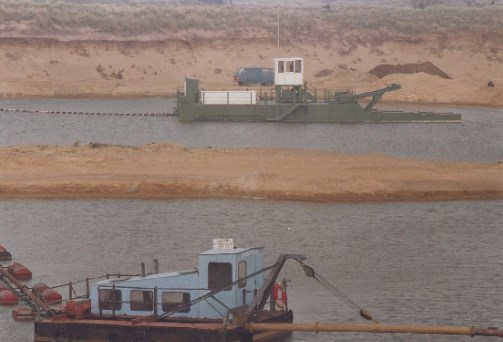 The first dredger, called Sand Piper, was designed and built by Warman International in the UK and was operational in the quarry from 1978 until 1989. It was superseded by a larger dredger designed and built on Island by the then owner James Simon, who bought the business from his father in 1987, which was operational from 1989 to 2004. He decided to build the replacement dredger locally due to the high cost of transporting a new dredger to Jersey. In this picture you can see both dredgers. In 2004 the decision was made to change the operation to excavate material from below the water using an excavator and a dry screening plant. 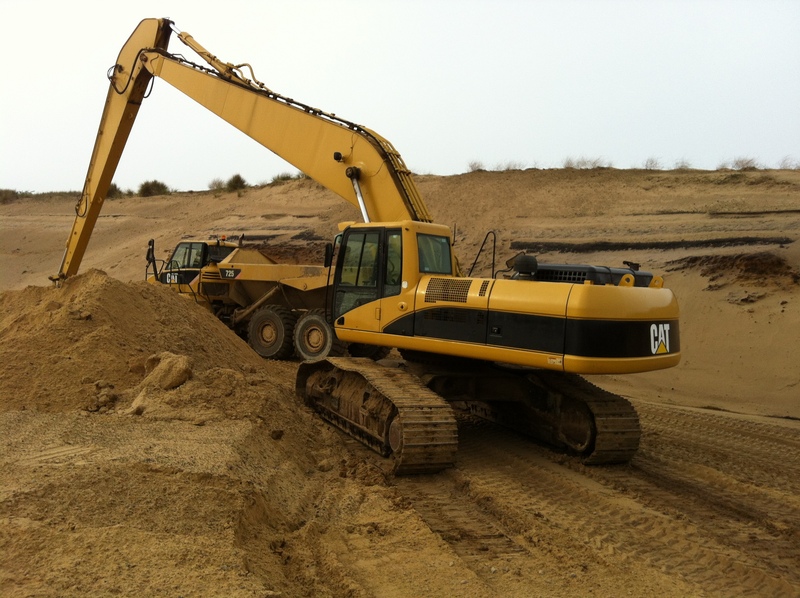 Jason Simon, who became the owner in 2005 and the 5th generation of the Simon family to own the quarry, purchased a CAT 330C Long Reach Excavator. Weighing in at 43 tonnes, it has an 18 metre reach and a 9 tonne counterbalance enabling it to work safely alongside the water's edge. This method of extraction is still employed today. The sand is excavated from below the water, stockpiled along the water's edge and allowed to dry for several days. As seen here, it is loaded onto an Articulated Dump Truck with a 25 tonne payload and transported to the sand processing plant area. 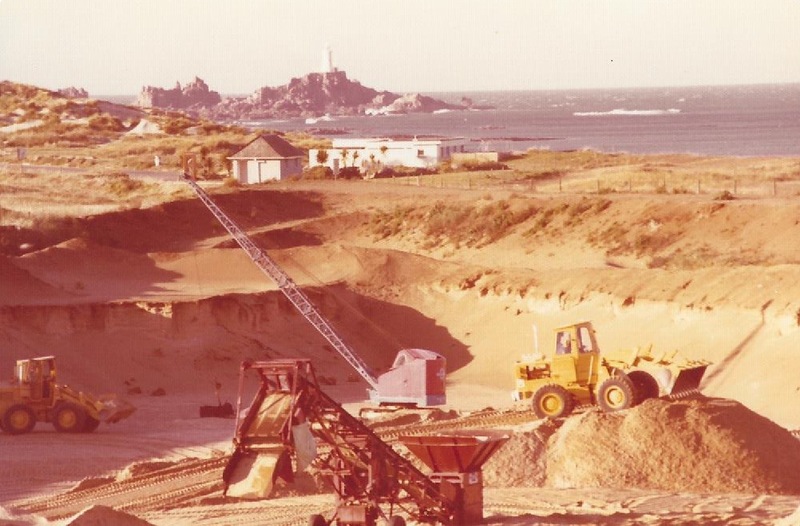 The sand and gravel quarry has been owned and operated by the Simon family since 1909 when the land in St Ouen's Bay was purchased from the States of Jersey by Walter Simon. 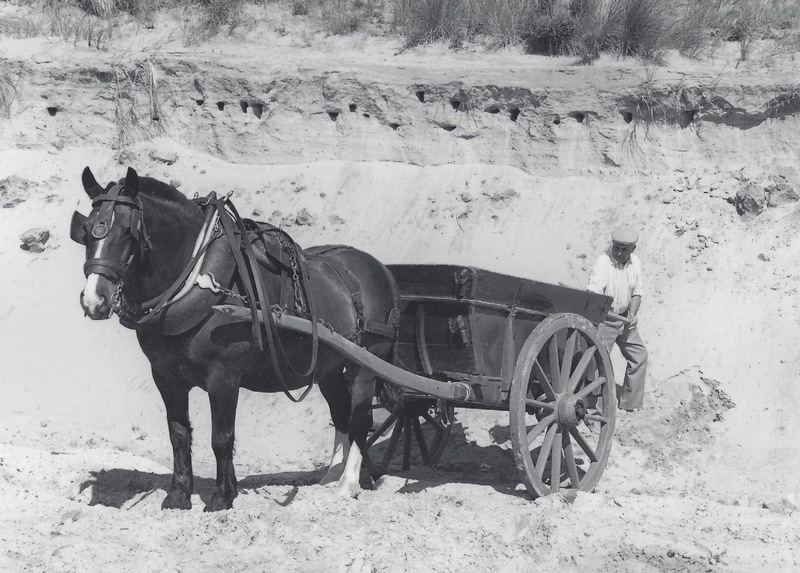 The first sale of sand was also recorded in this year although farming and growing remained the primary family businesses until the early 1960's. The first picture shows Osmund W Simon recreating the early days of loading sand by hand with a shovel into a horse drawn cart. Osmund recalls: "Back then chaps would turn up with their carts and have a small wager between themselves to see who could load his cart the quickest." In the early 1970's the quarry site relocated towards the coast and in this early colour photograph the depth of the excavation can clearly be seen. More machinery was purchased with the addition of two wheel loaders. The Caterpillars, a 910 and 920 (tipping over the stockpile), became the company work horses and remained with the business for the decade. 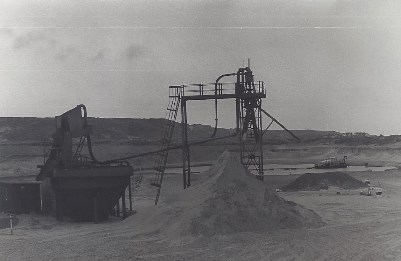 In 1977 the company was granted permission by the States to extract sand from below the water table and equipment was purchased which allowed for the washing and classification of sand products for the first time in Jersey. Dredging required a screening and de-watering plant which was also supplied by Warman International. The process saw sand, stone and water sucked up by the dredger and pumped along the pipeline to the processing plant. Here the stone was screened out into various sizes and the sand and water allowed to fall into a settling tank. From here it was pumped up to a hydro-cyclone which separated the sand from the water returning the water back to a settling lagoon and stockpiling the sand. In this picture from c.1977 shows the first processing plant with dredger in the background.